Adult flatfoot may be due to multiple problems including a dysfunctional posterior tibial tendon (PTT), hypermobility and ligamentous laxity, or possibly a coalition that becomes symptomatic. For a vast majority of patients, posterior tibial tendon dysfunction (PTTD) is the cause of symptomatic flatfoot and is the main trigger of surgical reconstruction in flatfoot. 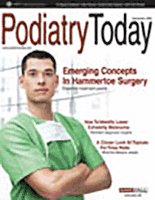 The common presenting scenario for adult flatfoot is a case of unilateral flatfoot with pain. Patients will often confirm they “always had flat feet” but have noticed increased pain and additional collapse in the past few months to years. They may also note increased swelling and a possible concern over one foot increasing in shoe size. After a comprehensive dermatologic, neurologic and vascular assessment, one should direct his or her attention to the musculoskeletal portion of the exam. It is key to examine the foot and leg as a whole in order to determine the proper procedure and consider each phase of the corrective surgery. Starting from the knee down, check for any bowing of the tibia. A tibial varum will cause increased medial stress on the foot and ankle. This is essential to consider in surgical planning. Check the gastrocnemius muscle and Achilles complex via a straight and bent knee check for equinus. If the range of motion improves to at least neutral with bent knee testing of the Achilles complex, one may consider a gastrocnemius recession. If the Achilles complex is still tight with bent knee testing, an Achilles lengthening may be necessary. Check the posterior tibial muscle along its entire course. Palpate the muscle and observe the tendon for strength with a plantarflexion and inversion stress test. Check the flexor muscles for strength in order to see if an adequate transfer tendon is available. Check the anterior tibial tendon for size and strength. In the case of a PTT that is still somewhat functional but weak, a split anterior tibial tendon transfer may be the best choice in order to keep the function of the flexor tendons intact. However, the flexor digitorum tendon transfer is still the best choice for patients with PTTD as the PTT is an active muscle and is necessary for additional support of the arch. Bear in mind that most posterior tibial muscles have lost functional power by the time the patient with dysfunctional PTTD presents for care. Perform a structural assessment of the foot and ankle. Check the ankle for alignment and position. When it comes to patients with severe PTTD, the deltoid has failed, causing an instability of the ankle and possible valgus of the ankle. This is a rare and difficult problem to address. However, if one misses it, it can lead to dire consequences and potential surgical failure. Check the heel alignment and position of the heel both loaded and during varus/valgus stress. Compare range of motion of the heel to the normal contralateral limb. Check alignment of the midtarsal joint for collapse and lateral deviation. Noting the level of lateral deviation in comparison to the contralateral limb is critical for surgical planning. Check midfoot alignment of the naviculocuneiform joints and metatarsocuneiform joints both for sag and hypermobility. Observe forefoot to hindfoot alignment. Do this with the patient sitting and the heel in neutral, and also with the patient standing. I like to put blocks under the forefoot with the heel in neutral to see how much forefoot correction is necessary to help hold the hindfoot position. One last note is to check all joints for stiffness. In cases of prolonged PTTD or coalition, rigid deformity is present and one must carefully check the joints of the midfoot and hindfoot for stiffness and arthritis in the surgical pre-planning. Following the musculoskeletal examination, consider diagnostic testing. In our offices, we use both magnetic resonance imaging (MRI) and diagnostic ultrasound for PTT examination. We also obtain standard foot and ankle weightbearing radiographs to check for joint alignment and arthritis. I have found diagnostic ultrasound to be very helpful in the early diagnosis of PTT problems and in checking the muscle for function. While one can check movement and function of the PTT with ultrasound, I usually will get a MRI as a backup when I have an index of suspicion for a possible PTT tear. Obtaining a MRI enables you to get a full image of the tendon, the surrounding ligamentous structures and the hindfoot and midfoot joints. I also use MRI to check the ligamentous structure integrity, especially the lateral and medial ankle ligaments, and the spring ligament. If I suspect ligament weakness of the ankle, I may perform a stress test to check the level of instability in order to plan the surgery properly. After examining the findings from the history, physical exam and diagnostic testing, I begin to plan my surgery. After performing over 100 surgeries to address PTTD in cases of symptomatic adult flatfoot, I have found there are many surgeries that can solve the same problem. However, certain guidelines are important to keep in mind for surgical planning. My key priorities are ensuring balance of the entire foot, decreasing hypermobility and dealing with equinus if the foot cannot get to neutral. First consider the issue of balancing the entire foot. In most failed flatfoot reconstructions, the surgeon repositions the hindfoot but does not deal with the midfoot and forefoot. For example, imagine a flexible flatfoot with a forefoot varus, a hypermobile first metatarsal and heel valgus. One may correct the heel valgus with a subtalar arthroereisis implant but then neglect to address the forefoot. This will cause a problem worse than what the patient had prior to surgery. In order to understand this issue, think of the foot as a tripod. With the heel in valgus, there is no midfoot varus or first ray elevatus. If the surgeon does not note that the third leg of the tripod, the first metatarsal, is poorly aligned and tries to deal with the hindfoot through a varus correction of the valgus subtalar joint, he or she will raise the arch of the foot and increase the forefoot varus. This will cause a severe imbalance of the foot and result in greater pain. In order to deal with the hindfoot valgus, one must consider the midtarsal lateral deviation and the forefoot varus level in order to obtain adequate information for proper foot balancing. A better example of foot balancing would be to take the same case of forefoot varus without hypermobility and hindfoot valgus, and deal with the conditions as a unit. If there is minimal midtarsal lateral deviation, combining the arthroereisis with an opening wedge medial cuneiform plantarflexion and tendon transfer/equinus correction may result in an excellent outcome. I would emphasize checking the forefoot first for both hypermobility and varus. If you do not deal with the forefoot issues, you will have a poor outcome. After considering the forefoot issues, determine the optimal choice for hindfoot correction and then plan the forefoot correction that will best act as an adjunct to the hindfoot correction. The second key priority is dealing with hypermobility. This is often present in the arch. If it goes untreated, this may result in continued arch pain and overload on the transferred tendon. The hypermobility is either at the naviculocuneiform joint or the metatarsocuneiform joint. I have found that dealing with either joint can stabilize the arch as a whole. Since many cases of PTTD also have associated bunion deformities, I usually use a Lapidus procedure to address hypermobility with or without plantarflexion wedging of the joint. Finally, dealing with the equinus issues is essential. In many cases of failed surgery that present to my office, the equinus issues have not received attention. In such cases, the rate of stress through the midfoot is mainly due to the tight Achilles or gastrocnemius complex. Performing a straight and bent leg test prior to surgery is helpful in identifying the cause of the equinus. I have found that most cases of flatfoot reconstruction do very well with simple endoscopic gastrocnemius recession. It is rare to find the need to lengthen the Achilles proper and there is less risk of posterior quadrant weakness with gastrocnemius recession than with Achilles lengthening. What is the procedure of choice for adult flatfoot reconstruction? It depends on the situation. I have found that certain procedures work exceptionally well as a whole. One of the best procedures for hindfoot realignment is an Evans calcaneal osteotomy. The procedure offers very strong correction of the abduction of the midfoot at the midtarsal joint, decreases the stress on the PTT and corrects hindfoot valgus. Furthermore, there is no increase in forefoot varus as the procedure is an adductory correction and not a varus correction. I will, on occasion, combine a posterior slide or subtalar arthroereisis procedure with an Evans calcaneal osteotomy in very severe flatfoot cases or severe hindfoot valgus cases. However, I find the need for these additional procedures to be rare. I will also substitute a calcaneocuboid fusion with bone grafting in cases of severe hindfoot abduction in an older patient who may have some lateral hindfoot arthritis. Substituting this procedure may help prevent arthritis of this joint from a large graft Evans procedure. As I previously noted, I am a firm believer in the gastrocnemius recession procedure. I find that an endoscopic approach decreases the risk of scar formation and results in a better aesthetic appearance. For the correction of the midfoot and forefoot issues, I am a fan of fusion procedures. I prefer a fusion versus an osteotomy as I want to increase the stability of the midfoot. If there is a stable midfoot with a forefoot varus, I prefer an opening plantarflexion wedge of the first cuneiform but this clinical circumstance is rare. In most cases, the midfoot is unstable and if there is an associated hallux valgus, I prefer a Lapidus procedure for a first metatarsocuneiform fusion. If there is no hallux valgus, I will usually either fuse the first metatarsocuneiform joint or the naviculocuneiform joint. Both joints are fairly easy to fuse and with good internal fixation, the rate of nonunion has been very low in our institutes. Finally, I have found that with the advent of the Bio-Tenodesis Screw System (Arthrex), flexor digitorum tendon transfers have had excellent outcomes for dysfunctional PTT tears. Of course, when it comes to rigid cases of flatfoot, physicians need to check for both coalitions and arthritic joints. One must either remove the coalition or, in arthritic cases, consider a fusion of the arthritic joint.